"The Bachelor Winter Games" premieres on Tuesday, February 13th at 8 p.m. EST on ABC. NEW YORK -- 25 bachelors and bachelorettes from around the world are coming together in Manchester, Vermont, to compete against each other and maybe get a second (or third) chance at love on "The Bachelor Winter Games." The show hopes to be a show of unity and love and will span four-episodes. Aside from the international cast members, "Bachelor Nation" will rejoyce that several "Bachelor" and "Bachelorette" favorites are returning! Most notably season 20 "Bachelor" Ben Higgins, who is a bachelor once again after his split with fiancee Lauren Bushnell. Host Chris Harrison and Ben both took some time to talk about "Winter Games" and what viewers can expect. Jennifer Matarese: Hey, so Chris, I noticed that you're rocking a beard in the beginning of the show. Was that a big deal? Ben Higgins: I love it. Chris Higgins:	This is funny. This is funny. OK. So typically if I'm not working, I get lazy and I do have a little bit of a scruff or whatever. So I came, I - you know we finished production on (Arie's season) of the Bachelor and I had about, I don't know, about two, two and half weeks before I had to be in Vermont. And so from the moment I left Peru with (Arie's) show, I had pretty much didn't shave until I got to Vermont. And so, because on the Bachelor and Bach - on the Bachelor and Bachelorette I'm this clean cut guy. I'm always in those suits and ties and I have that like role to play. And I think part of what Bachelor nation appreciates is that you always get the same guy. It's like there this comfortable - comfortability to it. Well, I showed up in Vermont, fully expecting to obviously shave before we started production, and everybody started coming up and saying, "Oh that's great. You're going to leave this. We're in the mountains. You should leave it. You should leave it." Chris Harrison: And I said no, no, no, I'm going to shave before tomorrow's opening ceremony. Don't worry about it I'm going to shave. And it actually kind of did become a thing enough that I said, "OK, I'm going to at least leave it for one episode and then I'll get rid of it." So yes, it was kind of funny and it was not my intention to ever have any scruff on TV or whatever, but I was talked into it by enough people. I said, "The heck with it. I'll let it go." Jennifer Matarese: I like it. It's "Winter Chris." Chris Harrison: That's what I thought, see, I figured why not? We're in Vermont. It's snowing. The mountain manly-man side of me, I let it go. And I think Ben and the rest of the guys loved it. Ben Higgins: Of course ...I was just going to say I actually remember, I'm laughing because I remember very clearly, we had the parade that morning. So a bunch of people from around the city were standing out there, a bunch of people none of us knew and it was funny because on three different occasions, I remember that some of the ladies that came up for a picture after the parade was over, came up to me and said how good does Chris look with a beard? I was like you know what, he looks good. Like this is a new thing, I like it. Chris Harrison: Yes I had to - in all seriousness I had to get rid of it because I was providing too much competition (for you and the other guys). It's (Dean and Ben and Luke) those guys were getting no attention. I said you know what, this is about you guys not me. Jennifer Matarese: Well if the show goes on for another season, you should definitely, every season, for Winter Games have a beard. And Ben I just wanted to ask you, what is it that you hoped - did you want to change the public's perception about you at all or anything? What did you hope to show people by doing this show? Ben Higgins: Is that a question to secretly say, "You need to change the public's perception?" Jennifer Matarese: No, no I think actually most people like you a lot! But I was wondering, why do the show? Ben Higgins:	Honestly kind of since I've even decided to do these shows or not, the question always came down to either why not are what could this hurt? And when it came to Winter Games, I honestly - I don't know - Chris could stop me here if I'm getting myself in trouble. I had no clue what I was going to do; I agreed to do Winter Games not knowing at all what Winter Games was. And so they could have shipped me somewhere in the world and had me do a thousand different things and I wouldn't have known what I was getting myself into. It was really me just saying this, the Bachelor's been really good to me, it has, even through a really tough relationship that still played a huge role in my life; the Bachelor has still been good to me, it's provided me an opportunity to get to explore myself more than I ever thought I would. It's allowed me to have experience that I never knew I could have. My life today has obviously changed from doing the Bachelor, but in a sense, it's just been enhanced. And so when it comes down to working and doing the Bachelor again, or a bachelor show again, it was why not? In a sense, I know this is probably crazy but I just trust it, I trust that something good can come from doing one of these shows and it's nothing that extraordinarily good comes from it, I know that I'll get to know myself a little bit better by doing this - one of the shows and so for me it was just why not? And there was no good reason why I shouldn't. Chris Harrison: Let me add that a huge thanks to the likes of Ben and everybody who did this because when we reached out to everybody, we didn't really know what we were going to have them do or what the show was. We had this basic premise and this idea, but we really didn't have the nuts and bolts of it. And while we were shooting (Arie's) season, there were meetings and we would sit in airport lounges and as producers and try and figure out OK, Winter Games starts in three weeks, what are we going to do? But we really appreciate the trust that Ben and Luke and Dean and Lesley and Clare and Ashley all these people have in us that we're going to treat them right; it's going to be fine; it's - at the end of the day it's always going to be about those relationships and building relationships and so they know that. But we begged Ben to come on this show and I know he was reluctant and I even put a personal call or two or three or four or five in to him, begging him to do this because we needed someone like Ben to validate the show and show that it's real. And I think people trust him and he trusts us and so I think it helps build that and people will say hey, if Ben's there, if Luke shows up, or Ashley I. is coming back then this must be legit and so we appreciate that they have that trust in us and we have to build that by treating them right. But the show wouldn't be the same if we didn't have those big names. 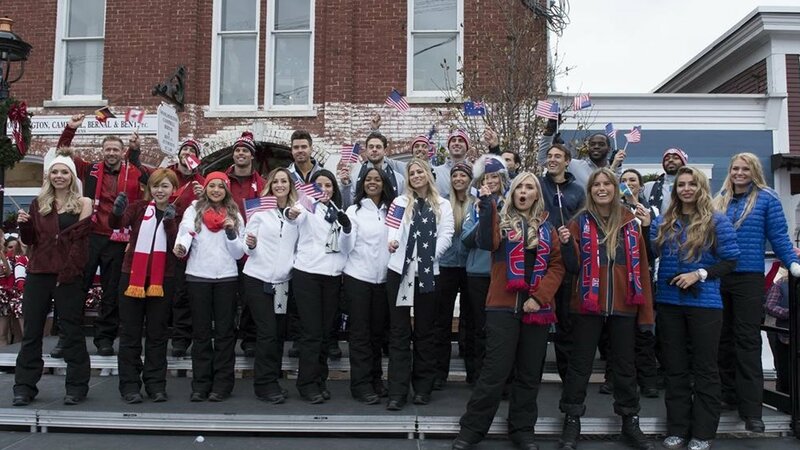 Don't miss "The Bachelor Winter Games," beginning Tuesday, February 13th at 8 p.m. EST on The ABC Television Network, streaming and on demand.